With Johnny Delgado's passing this week, we'd like to pay tribute to this great actor by posting some screencaps from his movies with the Superstar. Nora Aunor and Johnny Delgado in Gerardo De Leon's Banaue. Click here for more Johnny Delgado movies from Video 48. 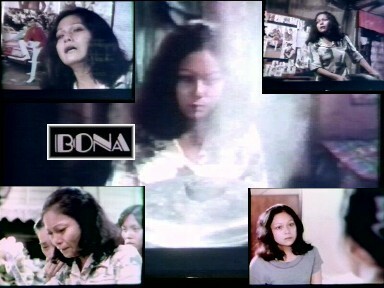 Nora Aunor's Bona was voted by Cinema One viewers as the film with the scariest scenes. Viewers must be responding to the shocking ending sequence. Another Nora Aunor classic, Himala, was voted "Pang Award", most dramatic lines. Guy & Pip, King & Queen of Hearts No More? Unfortunately, our favorite love team was defeated by Gerald Anderson and Kim Chiu in this category. I guess, times have changed, indeed. Click here for more about Cinema One Viewers Choice awards. Copyright 2009 Superstar Nora Aunor. All rights reserved.